Some strange and wondrous beings visited our backyard pond in recent days, taking advantage of the unusually cold weather we’d been experiencing. They disappeared last night, and I doubt I’ll see them again this year. After a month of sunshine and extreme (for us) low temperatures, we’re finally getting back to our “normal” west coast winter: grey skies, rain and – mercifully – warmer temperatures. The daily dose of sunshine was nice while it lasted, and I enjoyed meeting the lovely, dancing pond creatures. But I’m a true west coaster, so I’m happy enough to have the familiar sound of rain on the roof once more. 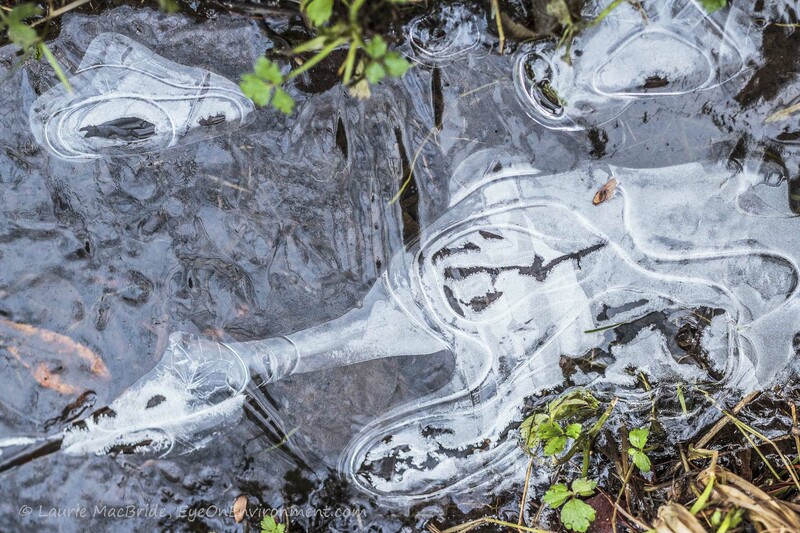 Posted by Laurie MacBride, Eye on Environment on January 16, 2017 in BC coast, Musings on Life and tagged abstracts & impressions, beauty, cold, ice, imagination, nature, ponds, rain, weather, winter. Thanks, Sherry. Yes, I don’t envy you! Stay warm, stay cozy…I’m sure you can find lots of interesting photographic subjects indoors!